Bashar Assad, son and designated successor of late Syrian President Hafez Assad, makes a fist as he follows the coffin of his father into the mosque of Qardaha, the home village of the late Syrian leader, June 13, 2000. n Arab countries that don’t have monarchies, the model for aspiring family dynasties was set by Hafez Assad, the iron-clawed “Lion of Damascus,” who died on a sunny June day in 2000…..
Repression, poverty and a general lack of freedom and democracy are the root causes of the Arab revolts. But the family successions being prepared were the frustrating signs that nothing would change. Making matters worse was the widely held view of Gamal as leader of a highly corrupt new guard within the ruling National Democratic Party, which made its fortune through the privatization of Egypt’s economy in the l990s. The old guard, including a military hierarchy that has dominated Egypt since the overthrow of the monarchy in 1952, saw the heightened corruption as needlessly provocative in a country where 40 per cent earn less than $2 a day…. In Yemen, Saleh was promising to dump his son at the same time as Mubarak was dumping his. …. The UN tribunal investigating the assassination of Lebanese Prime Minister Rafik Hariri has ruled that acts of terrorism can be prosecuted under international law. The decision will have far-reaching legal implications, but could also increase political turmoil in Lebanon and cause the Hariri case to collapse…. Iraqi security forces detained about 300 people, including prominent journalists, artists and lawyers, who took part in nationwide demonstrations Friday, in what some of them described as an operation to intimidate Baghdad intellectuals…. Prime Minister Nouri al-Maliki, who only recently formed a fragile governing coalition that is supported by the United States, was apparently concerned about the protest billed as Iraq’s “Day of Rage.” Leading up to Friday, he ordered a curfew on cars and urged Iraqis to stay home, as a government spokesman warned of “terrorists” who might use “sniping and silencer pistols” to target crowds. Security forces raided a prominent journalist watchdog group involved in organizing the protest. Around 4 p.m., Aldiyar TV manager Fiysal Alyassiry, who had broadcast the demonstrations, reported that security forces had attacked the station, beat a worker, arrested seven people including a director and an anchorman, and closed the station. DAMASCUS, SYRIA: The rise and fall of a protest demonstration here recently shows that Syrians share the yearning for dignity that’s sweeping the Arab world – and also illustrates why President Bashar al-Assad so far hasn’t been threatened by this tide of anger. …. DAMASCUS, Feb 27, 2011 (Xinhua via COMTEX) — A recently published European study reported the squandered electricity energy in Syria was estimated at over 2 billion U.S. dollars, local Damascus Press news website reported Sunday. The study, prepared in cooperation with Syrian Energy Sector and financed by the European Union, said Syria’s squandered electricity rate is one of the highest in the world. The report attributed the squandering to the outdated low-tension network, saying that all government’s suggested procedures have failed to reduce squandering. The steadily declining of oil and gas production and depletion of reserves have pushed the Syrian government to seek for renewable energy sources, including wind and sun, to meet the rising domestic consumption. Netanyahu and his advisers are working on a speech that would outline an alternative to the interim agreement with the Palestinians, similar to Lieberman’s plan. That initiative, which Haaretz reported on a month ago, consists of establishing a Palestinian state within temporary borders on about 50 percent of the West Bank. The prime minister has been discussing the plan with Lieberman in recent weeks to understand it more thoroughly. ….Netanyahu told Merkel he was disappointed by Germany’s vote and by Merkel’s refusal to accept Israel’s requests before the vote, the source added. Merkel was furious. “How dare you,” she said, according to the official. “You are the one who disappointed us. You haven’t made a single step to advance peace.” The prime minister assured Merkel that he intended to launch a new peace plan. When it comes to Syria, we’re actively coddling a hateful regime as it faces unrest. Why won’t we encourage freedom-seeking Syrians to overthrow their oppressor, as we did with former allied countries like Egypt and Tunisia?…..
دعا عبد الحليم خدام النائب الرئاسي السابق والمعارض السوري، الرئيس بشار الأسد إلى “خطوة تاريخية” تتمثل في”تشكيل حكومة وحدة وطنية انتقالية تسلمها السلطة وتتخلى عنها” أي السلطة Abdal Halim Khaddam, Syria’s ex-Vice President and No. 1 dissident is calling for a NationalUnity government in Damascus, where, presumably, he would regain his old title. GAZA (Reuters) — Israeli warplanes bombed a half-dozen targets in the Gaza Strip on Saturday, wounding a 7-month-old girl and aPalestinian man, medics in the coastal territory said. Vienna (AP) — Diplomats say Syria has formally rejected a request from the head of the U.N. atomic agency for access to a suspected nuclear site…. The refusal was a snub to IAEA chief Yukiya Amano, who had directly asked Syria’s foreign minister in November to allow a new visit. The agency is attempting to probe both Syria and Iran. It is to release reports on both nations later Friday. “Much of Egypt’s nomenclatura consists of current and former army officers like Mubarak himself. Their inbuilt resistance to truly revolutionary change can be seen in the high command’s reluctance, so far, to countenance any investigation of the Mubarak family, or to outline a comprehensive vision for reform. They have yet to abolish Egypt’s notorious emergency law, or to release remaining political prisoners. Perhaps most disturbingly, the military has charged the last cabinet appointed by Mubarak with continuing to run the daily affairs of government. In short, it is not yet clear whether the generals’ understanding of “democracy” is closer to Mubarak’s than to the hopes so vividly expressed by their people. Yet there is no doubt that Egypt has changed for good, and with it the wider region. As the increasingly brutal suppression of uprisings in Yemen, Bahrain, and Libya shows, the Egyptian model of massive street uprisings may not work everywhere in the tyranny-prone Middle East. But in Cairo, at least, a newfound sense of empowerment and potential pulses vigorously. It will not be easily muted.”…. Beirut – While much of the Arab world continues to see thousands of people taking to the streets with calls for political change, a ‘Day of Rage’ planned in Syria this month drew only a few dozen protesters. Hundreds of Syrians did later demonstrate, but to demand an investigation into the alleged police beating of a young man in the capital Damascus – not to seek the toppling of the government, as protesters have successfully done in Tunisia and Egypt. Government officials attribute the lack of upheaval to President Bashar al-Assad’s popularity. ‘Such protests are useless in Syria because the president is not hated as much as Hosny Mubarak in Egypt. Our president has started to make reforms a few years ago,’ a Syrian source loyal to the president told the German Press Agency dpa. But rights groups and activists blame the low turnout on an internet crackdown initiated by the government. “Iran is the big winner here,” said a regional adviser to the United States government who spoke on the condition of anonymity because he was not authorized to speak to reporters. Iran’s circumstances could change, experts cautioned, if it overplayed its hand or if popular Arab movements came to resent Iranian interference in the region. And it is by no means assured that pro-Iranian groups would dominate politics in Egypt, Tunisia or elsewhere. For now, Iran and Syria are emboldened. Qatar and Oman are tilting toward Iran, and Egypt, Tunisia, Bahrain and Yemen are in play. Feb. 24 (Bloomberg BusinessWeek)Despite its position astride trade routes in Africa, Europe, and the Middle East, Egypt hasn’t secured a role in global supply chains. Nike (NKE), for example, buys shoes and clothing from 42 Vietnamese manufacturers that employ more than 198,000 workers, according to its website. Egypt, with a similar population, is handicapped by numerous taxes, uncertain contract enforcement, and insufficient skilled labor. Just five Egyptian companies employing 5,129 people supply finished products to Nike. From 2004 to 2009, per capita income rose 20 percent in Egypt. Vietnam posted a 34 percent income gain over that period. “They really need to penetrate global industrial supply networks,” says Marcus Noland, author of The Arab Economies in a Changing World. Between 1990 and 2009, Egypt’s per capita exports of goods and services rose at an average annual rate of less than 5 percent—about half the rate of India and one-third of China, says the IMF. Egypt, which has endured unemployment above 8 percent for years, must create 9.4 million jobs by 2020 to absorb the jobless as well as new entrants into the workforce. To do so, GDP would have to grow almost 10 percent a year, about twice the rate since 2000, says the IMF…… The bottom line: Egypt after Mubarak shows signs of resistance to the free-market reforms it must adopt before it connects with the global economy. (AFP) Russia announced Saturday that it intended to fulfil its contract to supply Syria with cruise missiles despite the turmoil shaking the Arab world and Israel’s furious condemnation of the deal. Since the ignominious withdrawal of Syrian forces from Lebanon in 2005, Damascus has managed to regain dominion over the country by exploiting its adversaries’ conflicting interests and weak resolve…………. Dardari argues that reducing taxes on food is going to create jobs in Syria…. “وفيما يتعلق بالخطوات العملية التي ستتخذها الحكومة لتحسين مستوى الدخل, قال الدردري إنه “يتم الاعداد لإطلاق مشروع تشغيل الشباب قريبا”، مؤكدا أن “هناك مجموعة من الإجراءات تسعى الحكومة لتطبيقها وهي موجودة ضمن الخطة الخمسية الحادية عشرة، حيث تم إصدار العديد منها مؤخرا ما يتعلق منها بتخفيض الرسوم الجمركية ورسم الإنفاق الاستهلاكي على المواد الغذائية”. For all the frantic activity over Libya, US officials believe that the intensifying challenge to the Bahrain government provides the greater threat to US interests. The major point here is a free and clean election, not who is running . Looking forward to have the same quick and forced “upgrade” to our non democratic Syria where the current ruthless thuggish dictatorial regime reacted to recent regional anxiety by arresting two or three. Going back to the previous post’s reform roadmap proposed by Majhool. I don’t have anything against it and I hope the President for example would run for elections at the end of his current term (in 2014) and I hope the United States would help and not place obstacles like it always does. I doubt what we will hear next month will deal with the Presidential aspect of reform though. Is it acceptable? to me it is, I am happy with the President, not in a hurry to see him out of office and I am convinced most Syrians are. I prefer to go for smaller bites and to chew on them comfortably. If everything goes fine, we go for the rest of the plate. Alex, I am sorry to sound like a broken record, but you somehow force me to. If most people are happy with the president then why not hold free elections where they can express their opinion? Do you really believe that bashar will win a free election? I am asking this with no sarcasm intended. Don’t worry, I expected it. I believe the President will most likely win free elections if held today. Is there a chance he would lose? … of course. When a campaign starts, everything is possible. In the US many candidates start being the most popular, then for some reason a few months later others surpass them. Not talking about what is right and wrong in general, my personal opinion and preference: I want the same “regime” to stay until we settle the Middle East conflict … and I expect that to happen in a few years max, in a constructive manner, of through an ugly regional war first. It WILL happen. Why would you care if a democratic regime emerged before a peace deal? The two issues are unrelated from a Syrian perspective. As for your view that Assad would get elected as President, it just beggars belief that such a popular person would need to repress freedom of speech so much. Why is he so afraid of criticism from teenage bloggers? What a psychadelic existance it must be to practice selective amnesia..
Mankind is free to critic and condemn all. Except in the case of a select few who cry “antisemitism”. And that we are told is ordained by God. But then “freedom is not free” it comes in billions of dollars year in and year out. 1) Why is a dictator better equipped to negotiate than a democracy? 3) If the plan is to do a deal with Israel and then declare democracy, why would Israel accept a deal with a regime that is close to expiration? Democratic Syria will take the land and then reneg all obligations as it will say that a dictator does not represent the people. AIG, Shai and other israelis can you give us your perspective on this? In your comment in the previous post, you compared the occupation of Palestinian territories and what the Palestinians are subjected to under the occupation, to the Syrian Army presence in Lebanon from 1976 to 2005. You also said that I had not read enough of your comments over time at this forum to have a fair assessment of your views (my words). Well your comparison of the occupation of Palestine with all its catastrophic results and consequences on the Palestinians, to the mission of the Syrian Army in Lebanon and its consequences, tells me how wrong your opinion can be. The Syrian Army entered Lebanon in 1976 to stop the genocide of the Christian Lebanese in Mount Lebanon and the Bekaa Valley with the encouragement of the International Community and the Lebanese President at the time Sulaiman Frangieh Sr. The Arab League had prior to that dispatched Arab forces including a Syrian component designated Kouat Al Radaa Al Arabia but they could not stop the civil war from intensifying, especially after the Lebanese Army disintegrated and units joined the fight on both sides of the civil war. The Syrian Army was successful where no other country could have been able to stop the carnage so swiftly and keep both sides from committing the genocide that they were capable of committing. The Syrian army was attacked by the same Lebanese Christians it saved and had to defend itself without using an overbearing posture, resulting in more casualties to the Syrian Army but sparing the Lebanese population. The Syrian Army had to stay as a peace keeping force in Lebanon at a great cost to Syria. Helped the Lebanese rebuild their Army and government to a point where they could be a country again before and after the Taef agreement, which it brokered with Saudi Arabia and the support of the International Community. When the majority of the Lebanese people demanded the Syrian Army to leave, they left as swiftly as they entered. Now how could you in your own rational and fair mind compare a peace keeping mission of the Syrian Army in Lebanon, that prevented Lebanese genocide, to the most brutal and oppressive of occupations and genocide against the Palestinians by Israel. Patriotism defeat ideology,If Assad get back the Golan, people will support him, but Israel will not give all the Golan back,The Assads has been promising us that they will get the Golan back for over 40 years,hope is not reality, and it is turning to a lie,we do not believe it anymore,Democracy will make us stronger,and we will get the golan back once we become democratic,and free,through uniting, and through getting better economy, where the regime spend huge amount of money on regime security,this money can be spent on economic improvement, certainly this happen when we get rid of corruption that hinders the economic progress, certainly it will happen when all the stolen money return to Syria, it amount to over 80 billions of dollars. the recent events in Tunis Egypt and Libya, and the uprising in Jordan Iraq and Yemen, gives us a window of oppurtunity, we may not get another chance for long time. If there is free election in Syria to-day Assad will loose badly,he stands no chance,not a zero chance,once the crimes and the atrocities exposed and made known,and the once the people know how much money he and his family stole, and once the devious deals he has done ,once all these things are exposed, there is no chance for him ro even survive ,let alone win an election. 1) He isn’t. In fact he lacks legitimacy. 2) Countries that have government by consent of the governed are much stronger than those that don’t. In modern times, government by consent is mostly democracy though one can imagine a very loved king or tyrant like what Alex believes the case is in Syria. 3) You are absolutely right. Israel would be very stupid to make an agreement with the Assad regime given what is happening in the Arab world and the much shortened half life of dictators. While not specifically relevant to the Israeli/Palestenia/Syrian it in substance confirms your comments in #8 above. It will be interesting to read Shai’s response to your erudite comments. As an aside SC allows the rantings of several for fomenting a revolution in Syria and one has the right to demand that non – israelis be afforded the same curtesy in fomenting a revolution in Israel. Other states with money who seem to buy the Lebanese elections are also included in the reason why Syria fears Democracy , she remembers the fifties when every other state used to interfere in Syria’s affair. I do not know why you think that president Assad can not win an election , If you look at his achievements in the last 10 years you should be surprised and concerned if he does not win as it only shows the poor maturity of the Syrian electorates . The US is leaving Iraq because of Syria. can you please elaborate on your knowledge about his finances and the wealth that he has.I have not read that anywhere . I reserve the answer till two more weeks,however a continuation of terrible corruption,putting people in jail for no reason,like Abu Elias Hytham Maleh,and so many others,is this what you call good achievements? Why dont you visit Syria,you have not been there for 25 years,then tell me if things are good. After the invasion of Iraq , there were many calls to go left and invade Syria and create in Syria the same mayhem that took and still taking place in Iraq , Syria and president Assad responded with opening the border with Iraq without announcing that under the rule that Syria does not have visa requirement for other Arabs to come to Syria and Yes that is the reason for the US planned departure from Iraq , otherwise they would stay and they might still try to stay as the are doing in Germany and Japan . Look at his deeds . When will you wake up and realize that Assad is killing the potential of the Syrian people? The regime has completely crushed the creativity of the Syrian people. Others are welcome to check the results in their favored research area. Being Shiite or Alawi,is not the reason to have prejudice against anyone,it is the favortism and total control of one sect over the rest,is what is the problem,I like Hassan Nasrallah,and I like Assad alliance with Iran,BTW Alawi is not shiite.there are so many difference between them. Assad denied he has anything to do with Iraqee resistance,he cooperated with US to secure border. If you remember Israel sent planes and bomb a place close to Damascus,George Bush talked to Assad, and promised him if he doesnot retaliate,he will protect Syria,republican members wanted to go and take over Syria, George Bush said no, he promised Assad that, this is what I was told by republican high officials. Superb performance by Mona Eltahawy at J-Street today! “If you want peace talk to the people not to the people suffocating us, not to the dictators”. I’m sure you like that part AIG … I just hope you like the rest of what she was advising them to do … don’t be 10 days late. My brother Alex ,once Bashar regime gone,you will be freed to give the real opinion that emanate from you consciousness . It would be very interesting to listen to you and other propagandists of the regime after Bashar’s mukhabarati regime time over. WHY discuss,your after me the deluge disk has been overused by arab dictators why do you keep repeating it ? And if your fear is the fate of our christian community ,do you ignore that it has seen its influence dramatically reduced during the last 4 decades in Syria whereas syrian muslims became more conservative because of the lack of freedom.Freedom and democracy will boost liberal tradition of the syrian people,i believe. I think that your problem is the lack of knowledge on syrian history and sociology because you dont suffer from the same kind of mini-sectarian disease of Bashar and inner circle. The moment Syria becomes a democracy I will demand serious peace negotiations with it from my government, I will not wait even 10 days. Ajami writes a heartfelt piece. Fouad Ajami is a special “academic”, because he tells the truth. He’s objective and doesn’t have any stake in propping up a dictator. Ajami doesn’t wave his wet finger in the wind like Freed Malaria. Dave Warmer had only good things to say about him. Ajami is a SAIS professor. Thank you for the detailed response. I beg to differ with you, however. I believe you’re painting a picture of Syria more rosy than Syrians themselves would. I’ve had friends from Lebanon and from Syria during those years, who used slightly different depictions of Syrian presence in Lebanon than “peace keeping”. While I really don’t want to get into it here, please take the time and ask Syrians and Lebanese. Syria has not only occupied, it actually ruled Lebanon. It robbed Lebanon of its resources and its freedom and its human rights. It created puppet governments that served Syria, and especially “the corrupt few” (politicians, businessmen, army generals, …) It used Lebanon for intensive smuggling, be it cars and luxury products, or be it drugs and weapons. Are you sure there are more Palestinians imprisoned in Israeli jails than Lebanese in Syrian/Lebanese jails over the years? Are you sure more Palestinians died at Israeli hands (what you call “Genocide”), than Lebanese, or Syrians (Hama), at Syrian hands? Do me a favor, you’re better than that. Don’t join Ghat’s purist propaganda attempts. They don’t work on me, and I doubt they work on anyone else here. To suggest Syria’s role in Lebanon was merely “peacekeeping” is, at best, preposterous. The truth is somewhere in between … Syria was not in Lebanon purely on a peacemaking mission, but it was not the pure blood sucker that many Lebanese (and Syrians) perceived. When you compare Syria’s presence in Lebanon to Israel’s occupation of Arab lands, just remember that Hafez Assad was offered Lebanon and he refused to annex it. Israel annexed the Golan and is settling the west bank and would love to annex it if it knew how to get rid of its Palestinian inhabitants. Israel was not invited to peace keep in the Golan or the west back .. it was there purely to continue enforcing its occupation of stolen lands. Syria did not take any Lebanese lands. As for corruption, you are right … smuggling, bribes ..
AIG … here is the full segment. Her message is more clear here. I am amazed at the confidence you have that a sudden change of regime will be beneficial to Syria. The ‘deluge’, well, we have seen that in Lebanon when the fragile equilibrium between the factions and religious affiliation was removed. It has not recovered yet in almost 40 years. We have also seen the ‘deluge’ in Yougoslavia at the end of the dictatorship, we have seen the ‘deluge’ in Iraq that seems to be with no end and I hope we won’t see it in Tunisia, Libya and Egypt. I am not as sure as you are that an abrupt change is beneficial to Syria who has shown a gradual growth in economy and social development, in particular after its departure from Lebanon that turned out to be the best thing they did. Contrary to the dictators of the above countries whose psychology is close to hysteria or senility, Bashar has a sound mind, his successful and pragmatic foreign policy shows it. He has developed amazing relationships with neighbouring countries, unheard in centuries. Above all he is close to the people, that makes all the difference in countries where emotions play a large role. He needs to overhaul the country constitution, replace the old guard with caution to prevent the exarcebation of tensions. I have to agree with Alex on this one. The Syrian occupation of Lebanon does not compare to Israel occupation of the West Bank and Gaza. Of course Montagnard description is totally disconnected from reality but at least Syria did not implant colonies in Lebanon. My comments to Montagnard were intended to show that Syria isn’t a “sheep” in its rule and occupation of Lebanon, if Israel is the “wolf” in the Golan and WB. By the way, Syria also never recognized Lebanon’s own independence, and it did take and impose numerous actions inside Lebanon to shape it into something much more favorable to Syria. For instance, it “helped” Lebanon enact citizenship laws that enabled a million non-Lebanese become Lebanese. And guess what nationality many of those million were? Not to mention the actual workforce that suddenly “flooded” Lebanon, with or without invitation. And as you mentioned smuggling, etc. I’m sure if Hafez Assad thought he could gain by so doing, he would have annexed Lebanon in an instant. But he didn’t want to inherit the problems that existed in Lebanon (and rightly so). He only wanted to benefit where he could, and benefit well he did from occupying and controlling Lebanon for as long as he did. Israel annexed the Golan Heights, and yet settled only 16,000 Jews there since. There’s every reason to believe this territory will one day return to its rightful owner. Israel did not annex the West Bank, and there’s every reason to believe most of this territory (probably 97%) will one day be ruled by someone other than Israel. I believe most Israelis want this, and even recent polls still show that (despite Israel’s obvious move to the Right politically). I can sit here and tell you how much Israel has built and created in the West Bank, for the Arab population, that never existed beforehand. But I would never think of suggesting that the Palestinians identify our 43 year occupation with the “building of our infrastructure”. I don’t think most Lebanese would identify Syria’s real activities and motivation over its 30 year occupation of Lebanon with “peacekeeping”. That was my point. I’m sorry – I beg to differ. Syria absolutely did colonize Lebanon. Using your terminology, it absolutely “implanted” its own population in masses inside the sovereign state of Lebanon, and in fact caused hundreds of thousands of Lebanese to leave their own country. I prefer looking ahead, rather than engaging in the miseries of our past. But it’s not only Israel that has good reason to “revise” parts of its own recent history. Let us at least be strong enough and critical enough to admit that. Syrian history does not need a revision it needs to be written. All what is emanating from Syria under the guise of history is a combination of lies, half-lies and wishful thinking. Syria’s invasion of Lebanon was a shameful affair that exposed the corrupt and ugly nature of our regime outside its border. Tal el Zaatar is our Sabra and Chatilla. – Lebanon institutions were preserved, so was its flag, identity, etc. Israelis even changed the name of the place to something that god told them that it was called. – All these actions were perpetuated by a force occupying Syria (Assads&co). Israel is a democracy and the people have voted for this. Under what standards are you comparing the ugly occupation of Jewish colonization to Palestine for more than 60 years to the Syrian army being in Lebanon which was part of greater Syria before the ‘fair’ west draw the borders and gave Palestine to the Jews (as a way to free Europe of them) and you continue shamelessly to compare it to Israel steeling Jolan? What history are you reading? Disney land’s history? Apparently you are the one who need to reread history, maybe Shami and Nour can help you if they could. If you think that you are trying to clean Israel image you are not doing a good job at all, you are being a pure Zionist in your latest comment which I understand as a way of you to defend your occupation but I’m not sure if there is any Syrian on here buy what you are selling, occupying Palestine by a democratic system or by a dictatorship is still an occupation regardless how much you try to make it democratic, it is an ugly fact and you are part of it. How about comparing the invasion and destruction of Beirut, Lebanon woth occupation of Lebanon by Syra. You, like the rest of outsiders, are full of it. I didn’t see you demanding any peace talks with Hamas. They were democratically elected by the Palestinians. Instead you demanded that they should be starved and attacked. We will be a much stronger society when we have leaders instead of rulers. What happened with Hamas was an excellent example of why dealing with dictators is not such a good idea. The moment Hamas were elected they rejected all previous agreements and understandings that were negotiated and they would not renounce violence. In your comment in 24 you not only missed my point you are misrepresenting the facts. Let me clarify some points for you. You said that you had some Syrian and Lebanese friends that would depict the Syrian Army’s mission in those years in a slightly different way. I don’t need to rely on friends stories to know what happened during those years. My family has roots in both Syria and in Lebanon, as a lot of families do in both countries (they used to be one country up to the time of the French invasion and occupation to impose the mandate). I lost many relatives during the Lebanese civil war, all of them civilians non combatant who were victims of being at the wrong place at the wrong time, in Lebanon, except for one, who was in the Lebanese Army, answering the call of duty. When Lebanese factions were kidnapping and killing civilians indiscriminately, when the Lebanese Army disintegrated, when the Arab Forces could not defend their positions let alone enforce any truce that was negotiated, when the social fabric was being torn at the seems, there was no end to the escalation of the civil war. People were killed for the mere reason of what their name was on their ID cards. The destruction, burning and looting of complete villages, and the downtown area of Beirut, including the port of Beirut. Throwing people alive from the roof top of the Holiday Inn tower, in front of cameras, in Ras Beirut. Chaining and dragging people alive behind cars. Collecting ears and fingertips as trophies, were just a part of the atrocities committed by both sides. There was no law and order, no civil life, no government presence whether in services or otherwise. The Lebanese Lira, which was amongst the strongest of currencies worldwide before the civil war, lost its value over a short period of time. When Fatah, Al-Morabetoon, Jaysh Loubnan Al-Arabi, Kamal Jounblat progressive forces and their allies were surrounding Zahleh and about to overcome the rest of Mount Lebanon and the Bekaa Valey, Syria decided to send in its Army at the request of Lebanese President Sulaiman Frangieh, who was not at the time a friend of the Syrian government. The Syrian Army fought its traditional political allies, the progressive leftist groups, to save the Christian Lebanese from a major genocide that was about to take place. By force and not by persuasion the Syrian Army had to impose many a truce after it entered Lebanon in 1976. I am convinced (and that is my personal opinion) that had the Syrian Army not entered Lebanon and impose a peace, which was continuously violated by all sides, Lebanon would have become like what Somalia is, warlords and bandits killing and looting whoever and whatever was left. People had to figure a way to make it to Damascus to apply for a visa to leave for Europe or the USA, no embassies were functioning in Beirut. Some who could not go to Damascus had to take the unreliable ferry service from Jounieh to Cyprus. The Syrian Army with all its shortcomings was in the middle of an untenable situation, and had to keep a peace that did not even exist. Like I said it was by force and not by persuasion. The Arab League cut off any financial help Syria was receiving after the 1973 war because of its decision to enter Lebanon in 1976. The Soviet Union, the major supplier of arms and ammunition to Syria at the time, put the squeeze on Syria for its decision to enter Lebanon at that time. That peacekeeping mission was very expensive for Syria with its limited resources. Between 1976 and 1982 when Israel invaded Lebanon, Syria was policing Lebanon in spite of all the warlords on both sides. You said that Syria stole the Lebanese resources. What resources Shai. Educate us. Lebanon was burning, bleeding with nothing left resembling a country or a civil society standing and you say that Syria stole resources? Today if Syria would not be able, for whatever reason, to provide what electricity goes through the grid from Syria to Lebanon, Lebanon would be facing a major electricity shortage. I just don’t know what resources that Lebanon had at the time that Syria stole. I grant you some officers and soldiers abused their positions and power, but it will pale compared to what the warlords committed in atrocities on the Lebanese population. The smuggling of commercial merchandise from Lebanon to Syria over the military border crossing, was to the Lebanese benefit, as they were selling the product to the Syrian military at a profit, who in turn shipped it to Syria and sold it, denying the Syrian treasury any taxes or custom duty revenues. Between 1982 and 2000 Israel was occupying part of Lebanon, which made the Syrian Army’s mission even harder, as the Syrian Army had not only to worry about keeping the warring factions from killing each other, but to also defend its positions from the invading Israeli Army. With all the mistakes and abuses that the Syrian Army committed in Lebanon (they are indefensible), its intentions were noble and can not be compared to the Israeli occupation and treatment of Palestinians in the territories. When the Lebanese demanded the Syrian Army to leave Lebanon in 2005, it left a country with a strong Lebanese Army and a functioning government and a society which will think twice (I hope) before resorting to civil war again. Syria spent valuable resources in Lebanon for the sake of Lebanon’s interest and the interest of Syria, which in this instance had coincided. History will show that the Syrian Army peace keeping mission was a rare accomplishment in the Middle East, but for you to equate it to the Israeli occupation is so far out of line, that you make me question your intimate knowledge of history of the region or your deliberate misleading efforts to paint the occupation with your own brush. I can forgive you for not knowing some intimate details about Syria and Lebanon, but I will not let you get away with equating the Israeli occupation to the very difficult peace keeping mission that the Syrian Army faced in Lebanon. Anyone comparing the Syrian presence in Lebanon to the “Israeli” occupation of Palestine is either completely ignorant of reality or is pushing a clear agenda. Syrians and Lebanese are historically a single people and share a single socio-economic life-cycle. This means that movement between Lebanon and Syria was continuous and ongoing from the time preceding the creation of both political entities and since that period. Whether or not the Syrian army entered Lebanon, there was going to be a continuous flow of people across both sides of the border, which is still taking place today even without Syrian troop presence in Lebanon. There were hundreds of thousands of Syrian workers in Lebanon before the civil war in Lebanon started due to the poor economic conditions in Syria and because Lebanese refused to take on menial jobs that Syrians were willing to do. My mom’s uncles are farmers who have always employed Syrians in their fields because as they have told us they can’t find Lebanese willing to do those jobs. As far as the Syrian troop presence is concerned, this emanated from Syria’s wish to prevent complete instability in Lebanon and keep the country from falling into “Israeli” hands. While corruption was rampant during Syria’s presence, this was a result of the corrupt systems in both entities and the dealings between corrupt politicians and other officials on both sides of the border. Syrian officials and politicians benefited from various corrupt activities in both Lebanon and Syria, much like many of their Lebanese counterparts did also. This wasn’t a case where it was Syria sucking the blood of the poor Lebanese, but an added testament to the inherent corruption of both regimes. But as other stated, Syrian soldiers also lost their lives protecting Lebanese and defending them against both internal and external attackers. Moreover, comparing the number of prisoners and civilian casualties caused by Syria and “Israel” (even though in both cases “Israel” far exceeds Syria) is a ludicrous way of determining which side is a bigger threat. This would be like saying that the US government has killed more Americans than Al Qaeda (millions of Americans were killed in the US Civil War) and thus they are both equal. “Israel” was created on the basis that this land belongs to the Jews and that its indigenous population must be expelled. Palestinians were therefore ethnically cleansed from their land and turned into refugees both in their own country and abroad. They have been prevented from returning to their native land and have been forced to live in squalid conditions and in what are essentially bantustans, while “Israelis” continue to expropriate more land and build more settlements in order to settle Jews there. Anyone who even suggests that there are any similarities between that and the presence of Syrian troops in Lebanon either has completely lost their mind or is assuming people around them are dumb. I appreciate your lengthy and detailed responses. I certainly do not know as much about Lebanon as you do. Nor do I intend to enter a comparison match between Israeli occupation and the Syrian one. But I will not buy, not even for a minute, that Syrian presence in Lebanon for 30 years has been about “peacekeeping”. That is as outrageous a claim as it would be for me to suggest Israel came into Lebanon in 1982 to liberate the Shia in the South (who at the time received the IDF with olive branches). You cannot suggest that Syria occupied and ruled Lebanon for 30 years, because it was there to keep the Peace. Syria colonized Lebanon. It implanted its own population inside Lebanon. It decided the fate of the Lebanese people for thirty years. It also caused the displacement (emigration) of hundreds of thousands of Lebanese. It never recognized Lebanese sovereignty. It was forced out of Lebanon, it didn’t leave because suddenly Lebanon became a peaceful place to live in, that didn’t need Syria anymore. Please don’t deflect by suggesting I’m comparing Syria to Israel. If any of my claims about Syria are untrue, please point out which ones. “It also caused the displacement (emigration) of hundreds of thousands of Lebanese” The Syrian did? Are you seriously blaming Syrians for the immigration of ‘hundreds of thousands’ of Lebanese? What about the warlords, the Israelis and the Lebanese themselves, you think those are innocent? I understand you’re not pushing an agenda with your frequent use of quotation marks around the word Israel (“Israel”), but of course I have my own agenda when it comes to Syria (not “Syria”). My agenda was, in the case of the past few comments, to demonstrate the hypocrisy in highlighting only Israel’s treatment of its own minorities, and participating in no self-criticism whatsoever. You admit yourself that Lebanon is part of Syria, and therefore anything Syria does in Lebanon is justified. I’m sure you also believe everything wrong with Syria is caused by Israel (“Israel”). The massacre of tens of thousands at Hama was caused by Israel, right? The displacement of hundreds of thousands of Lebanese was caused by Israel. The lack of the most basic of human rights and freedoms, because of Israel. I can’t begin to think what “your Syria” would be like, the day Israel withdraws to the 1967 borders. What will you do? Btw, when do you plan to take back the territories of Lebanon, Palestine, Jordan, Iraq, Kuwait, and Cyprus, since they’re all part of the Syrian Nation, according to you? When does that stage begin? Do you honestly claim that the ruthless dictatorship that ruled Syria while it occupied Lebanon treated the Lebanese better than it treated its own citizens? Next you’ll suggest Syria was all about “freedom and equality”. No one’s buying it. Not even Nour. Your comments where about comparing the occupation of Palestine to the Syrian presence in Lebanon and that is the point I’m arguing with you about so please don’t use the useless techniques of raising the regime card to me and twist what I wrote..go back and read what I wrote you before you write me any comment like the one above. My agenda is that every inch of our national territory should be under our control. My agenda is not to go occupy someone else’s land and make it my own. I place “Israel” in quotations because I don’t recognize the right of anyone to violate the sovereignty of our homeland and to create a state on our land that is for their own exclusive group of people. That the Syrians and Lebanese are one people is an indisputable fact, regardless of how much you attempt to dismiss it. Syrians and Lebanese have been flowing across that artificial border since its very creation, and thus Syria doesn’t need to “implant” any Syrians in Lebanon. Like Jad said, where did Syria implant Syrians in Lebanon? Where are the Syrian settlements? Where has Syria forced Lebanese off their land? But when you are confronted with these facts you resort to the tired old line “you think everything wrong with Syria is caused by Israel.” Where did that come from? We are talking about a particular event in history, which you are comparing to the “Israeli” occupation of Palestinians land. But yes, “Israel” is a big part of the problem, because the entire Syrian nation was divided in order to make way for the Jewish state. And since then, European and US policy in the region has been centered around what is good for “Israel”. “Israel” didn’t directly cause the thousands of deaths in Hama, but “Israel”, through the US, supported the Muslim Brotherhood in their terror campaign in Syria which culminated in the events that they knew would result from such activities. But in any case, this has nothing to do with the topic at hand. And as far as uniting all entities within the Syrian nation, I have a right to call for such unity. I have a right to attempt to persuade my people that their unity is in their interest. I am not imposing anything on anyone nor do I accept that unity can be realized by force. And where did I say that everything Syria does in Lebanon is automatically justified? I merely said it cannot be compared to the “Israeli” occupation in that the Syrians are not attempting to create an exclusively Syrian state in Lebanon while uprooting and ethnically cleansing Lebanese. I criticized the corruption of Syrian officials and politicians in Lebanon much like I criticized the corruption and criminality of the various Lebanese politicians and warlords. As you both know, I did not come to SC to participate in bashing Syria to high heaven. I have better things to do with my time. My agenda is well know from day one – to try to bridge the gaps between us, not to widen them. Therefore I would like to end this now. If you examine my comments carefully, you’ll see that I never really compared Syria to Israel. The comments that followed said nothing about Israeli Occupation = Syrian Occupation. I certainly didn’t buy any attempt to depict Syria’s 30 years in Lebanon as purely that of “peace keeping”. I made my comments to highlight what I saw as hypocrisy. I hope you can appreciate at least that. Nour, you said: “because the entire Syrian nation was divided in order to make way for the Jewish state.” But wasn’t the Syrian Nation divided long before 1948? What does Iraq, Kuwait, Cyprus, Jordan, and Lebanon, have anything to do with making room for Jews? I hope we can one day come to accept each other. I am old enough to remember the story of the Syrian intervention in Lebanon and it looks like what you wrote . I think you are putting the hat of a fearful person of what is going on in the Mideast, That is not the self confident shai i know. then i might be wrong. Do you think that the Jews have the right to return to Palestine and live as equal.? as our children who are born in the West have the right to return to Syria?. Jad #31 did you read my comment before writing your response? Another aspect of the “repression” in Syria? There is no hatred. I always look forward, not back in time. The trigger was what I perceive to be ongoing hypocrisy practiced by some, who find it difficult to criticize Syria’s role in the region in the past or present, while studiously and continuously search, find, and share links to every critique of a Jewish Rabbi, an Israeli, or a Zionist. You know why I’m here. But there’s a limit sometimes to the rosy pictures some like to depict, whether implicitly or explicitly, about Syria. I think Jews have a right to live in the Levant, but I just don’t see how they will continue doing so when they continue excluding the Palestinians from their basic rights. The problem is that Jews think that its 700 BC where they can form their autonomous kingdom and exclude the Canaanites from within since people and tribes back then tended to be much more secluded than they are today. It will be hard for this to happen today. Jews continue to build settlement on land they admit is not theirs. What is the result of all that? A very possible scenario is an eventual bi-nation state with the Palestinians. Call it what you want, even Isratin like Gaddafi said. Both sides will eventually learn to live together and share power. Now, in the long term, it’s very hard not to see this “Isratin” forming some kind of economic and/or political union with Syria in some Levantine union. I’m not saying fully dissolve every person in that pot, but maybe some sort of federalism or at least an economically integrated union, which eventually leads to a political union. Historically, it’s very hard to separate the region west of the Euphrates. And with the world coming more close and flat than ever, eventually, all those small states will converge. Also it is important to note that this can only happen when each citizen has their rights protected and without having discriminating policies based on race or religion because this region throughout history has known countless religions and ethnicities, so only compromise and accommodation is possible. I disagree with the Nour and the SSNP and find their speeches and means very ideal, bombastic and unpractical. Big words and no reasonable action, and if they ever do any action, it would probably be war. The only way for this region to be more integrated is to build trust, through trade and good will. No side can wipe the PEOPLE of the other. Ideologies can be wiped out, people can’t. Any bombastic threats or fascistic approaches of that sorts, whether from zionists or SSNP or other ultra nationalists will lead to more war. I share your dream Shai. I’ve used before the term UME (United Middle East) to refer to what I believe will occur, sooner or later. We will be somewhere in between a U.S. and an E.U. No one today will be able to wipe out anyone. I also believe that at the rate Israel is going, indeed there will be a single state, with slightly more non-Jews than Jews. If Netanyahu wakes up tomorrow morning and understands this, he will probably seek the 67 borders before his time in office runs out. The entire people of the region have suffered already too much. It is time to end their suffering, to enable every people independence and freedom, which they deserve no less than any American or European or Australian. I hope Israel will do its share quickly. What really allowed Israel to survive till now is neither its great military power nor the current US or the previous French or the previous support from Communist countries. What really allowed it to survive was its ability to manipulate and control Arab governments (directly or thru other colonial governments). The game seems that it has changed. The Internet is allowing the Arab people to bypass the control of their governments and their Islamic mind controllers (sheiks). Hence, it is allowing them to create individually based movements, parties, liberation groups,… It is imperative that Israeli PEOPLE find a way to make a FAIR peace with their NEIGHBORS not with the bullies of the neighborhood. The Arab bullies and their colonial masters (the kings and the for-life-presidents) lost control and can no longer provide the fake protection. Now that Israel no longer can “manipulate and control Arab governments”, do you think Israel will survive? Unlike several Arab countries, Israel has fought her wars by herself. President Assad is always in a campaign mode . As dictators struggle with uprisings from Libya to Yemen, one country that has remained relatively silent is Syria—except for its ruling family. I say ruling family, because in 2000 Syria became a hereditary republic, when the late Hafez al-Assad bequeathed the presidency to his son Bashar. (Egypt was following in Syria’s footsteps, so was Libya, but the people put the kibosh on that). Bashar, 45, was training as an ophthalmologist in London, when he was called back to Syria upon his brother’s death in a car accident. The older son had been first in line for succession. Assad and his wife Asma, a former JPMorgan investment banker, have gone on a savvy charm offensive in prime media territory: The Wall Street Journal, and Vogue. They give a fascinating glimpse into Assad’s persona, and in Vogue’s case, his family life—complete with a spread of him at play with his children in their Damascus apartment. There’s no palace; they drive their own cars. On a recent trip to Syria, Brad Pitt and Angelina Jolie were a little nervous about the lack of security as Assad took the wheel. Asma recalls: “So I started teasing him [Pitt]—‘See that old woman on the street? That’s one of them! [security guards] And that old guy crossing the road? That’s the other one!” Could have been fooled. Despite that Assad is not afraid that a similar fate might befall his regime, because he thinks he’s in synch with the people he rules. “So people do not only live on interests, they also live on beliefs, especially in very ideological areas.” That is presumably a dig at the Egyptian government who broke away from its Arab brethren by signing a peace treaty separately with Israel in 1979, despite a cool reception from the Egyptian people. (Of course, that is not the cause of Egypt’s uprising). The piece in the March issue of Vogue is the perfect complement to the WSJ interview. Former French Vogue editor Joan Juliet Buck was enamored by Asma, who is Syrian but grew up in the U.K. Why not? Like Queen Rania of Jordan, she’s smart and stylish, and if her husband were an ally of the U.S. and had signed a peace treaty with Israel, she also might be hobnobbing with Bono or some other celebrity in New York. Asma al-Assad is busy building the foundations of a civil society, NGOs that are part of the reforms her husband mentioned to the WSJ. “It’s about everyone taking shared responsibility in moving this country forward, about empowerment in a civil society,” she said. Buck is invited to join the Assads for a Christmas concert in Damascus. As the choir sings “Joy to the World,” “Jingle Bell Rock,” and other carols, Assad leans over and says: “This is how you fight extremism—through art.” (In 1982, his father leveled the town of Hama to suppress an uprising by the Muslim Brotherhood). For now democracy will have to be confined to the ruling family’s kitchen table where each member is free to decide on what to eat. “We all vote on what we want, and where,” says Asma. It is the big wave and better to stay below the radar for now. Yes Nafdik, I read your comment very well before I respond. Why don’t you go read it yourself and let me me know what did I miss, educate me! First, let me say that no one has any problem with any person coming to any country if they intend to go there to live as equals. How many of us have moved to other nations where we intended to become equal citizens of their respective societies? The problem arises when a group of people claims a piece of land exclusively for themselves and wants to evict its indigenous population. The problem with “Israel” is that its very purpose was to create a land exclusively for Jews. Were it not for that Zionist project, most of the Jews who emigrated from Europe to Palestine would not have gone. Second, as for having an inherent “right” to go anywhere, that issue has always been highly debated, and is the focus of much of the discussions and arguments about immigration policies in different countries. Most Jews living in Europe and the US are citizens of those countries and enjoy equal rights to all other citizens there with no discrimination made against them. Moreover, they been members of those societies for hundreds and even thousands of years, most of whom have no real relation whatsoever to Syria (or its southern portion, Palestine) other than a religious/ideological attachment. Can they be equated with a first or second generation Syrian who may have immigrated to a foreign land for political or economic reasons? I’m not so sure about that. No descendant of a Syrian who left Syria a thousand years ago now claims Syria to be his/her land. But in the end, the key matter is whether, regardless of their origin, any intending immigrant aims to come to a given land to become an equal citizen on that land and take active part in its social life, or whether the intent is to claim that land as their own in complete violation of the national rights of the local population. What’s so “bombastic” about the points and arguments we make? Is it bombastic to insist that sovereignty over a land should be solely in the hands of the indigenous population of that land? Is it “bombastic” to demand that our citizens live a free life, away from the threat of occupation and annihilation? Were the free French “bombastic” in their approach to German occupation of their land? Were the Algerians who refused to accept French colonization of Algeria also “ideal” and “bombastic”? As for war, when did we go out looking to wage war on anyone? But we sure will not sit idly by when foreigners are dividing our homeland, occupying our country, and subjecting our people to humiliation. Social nationalists desire to build a strong, unified nation able to control its own destiny and able to take its rightful place among the nations. No social nationalist wishes to wage war on or to attack anyone, but part of working for the freedom and independence of your nation is to defend it against foreign threats and attacks. If that’s too “bombastic” for you, then most national and patriotic movements around the world, and indeed most independent nations, should be also viewed as “bombastic”. ”, do you think Israel will survive? Jad, there is no need for me to educate you. I just found your comment confusing in the context of what I was talking about. After years of observing your comments here on SC, I am still not impressed my friend. I like the President a lot but I did not like the timing of the Vogue article and I did not like the kitchen democracy story … it was not too wise given that the rest of the country does not enjoy the same privileges. Did you pay attention to HOW the author of the Atlantic piece, Max Fisher, pushed to get that particular barely-negative answer? … and who admitted anything about “propaganda”? .. it is you who is imagining that part and believing it. And why am I picking on you? … because you and others who share your way of thinking here have been picking on me every time I said something that you did not like. Shami, above decided to assume that I am only writing what I write because I am scared and that I will flip 180 degrees when Assad is deposed …. And a necessary reminder, this is Joshua’s blog and not mine, please don’t complain like you always did in the past whenever I criticized something you wrote, that this blog is restricting your freedom to express your opinion. You are free to write what you want, but I am free to tell you that you are really not impressive. What’s bombastic Nour is quoting Saadah, who just like Hitler made similar territorial claim for his volks in Poland, Czechoslovakia, Ukraine, etc. Saadah refused any to have Jews living in this greater Syria. What is your take on that? Should the Jew who’s been living in the region for several generations now be kicked out? and if they refuse, be exterminated? Also you call for parts of Egypt (Sinai), Northern Saudi Arabia, Kuwait, Iran (Ahwaz), Turkey (Alexandretta), Cyprus, and you consider that not bombastic? At no one time in history were all those regions united under one political union. To claim any of these lands as your land is a declaration of war against the whole world. Also what’s “social nationalist”? It makes no meaning but is a simple fictional construct by Saadeh that his followers keep using. I need ten pages to explain the many ways in which Syria’s presence in Lebanon was not the same like Israel’s occupation of the different Arab territories. I think your information and your opinion were mostly from Lebanese, Israeli, American and other anti-Syrian sources (including anti-Assad Syrians)… there is no shortage of those. You probably feel that all of us Syrians here who are rejecting most of what you read elsewhere are acting out of national pride and are not being objective in accepting what everyone else seems to agree on… that Syria was an occupier sucking Lebanon’s blood. I am a few years older than you so I can say “you were too young to remember” that before Syria opposed the Camp David accords Syria’s presence in Lebanon was seen as necessary and highly constructive. The mass brainwashing that involves anything that Syria does has been going on for decades. It is too tiring to even try to undo it in your mind, and I have no doubt you are the most objective and constructive person one can encounter. Remember that the massively anti Syrian Reagan administration signed in 1981 on UNSC council resolution 497 that considered Israel’s occupation of the Golan null and void, but did not call for any similar resolution against Syria … because there was not easy way for them to make such a claim. 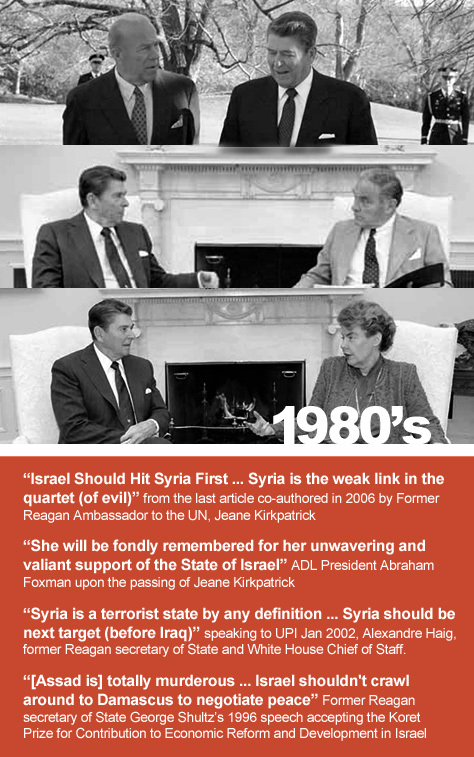 US ambassador to the UN Jeane Kirkpatrick was Likud’s best friend and Syria’s worst enemy … for eight years she could not propose an anti Syrian “occupation” resolution? I know I am expressing it in silly terms, but honestly ths is almost what I used to read in 2005 in M14 Lebanese blogs and other neocon friendly places. What happened instead? …. Syria’s economy started to perform better after 2005. The United States claims the Iraq war will end up costing 3 trillion dollars… and that is at a time when US troops will leave the country in a bad shape where tens of innocent Iraqis routinely get killed. Syria succeeded in ending the Lebanese civil war … and absorbed all the costs … saving Lebanon the cost of spending 2 billion dollars per year on their army and police force … for almost 30 years. If Syria (the country) benefited economically from its presence in Lebanon, it was not more than the cost of peace keeping there. But Syria should have left much before … 2001 at most. After 2001 there was mostly corruption and very little peace keeping. In the 90’s there was corruption and peace keeping (Israel was still occupying Lebanon) … in the 70’s and 80’s Syria gave much more than it took from Lebanon. Syria was never named explicitly. When we lose our objectivity in addressing matters we resort to emotional outbursts. Did you read Saadeh to understand what he meant by the concept of SOCIAL nationalism and what his definition of a nation is, which led him to the conclusion that all people living on the single geographic territory of natural Syria are Syrians? You simply threw out accusations that Saadeh is similar to Hitler because Saadeh claimed some lands are part of Syria and Hitler claimed some lands are part of Germany. Are the Egyptians who recognize that the entire valley of the Nile, which includes Sudan, is part of Egypt also like Hitler? Was Nagib Mahfouz like Hitler because he expressed his sadness and frustration that Sudan was wrested from Egypt? Are the Americans who expanded their land and included everything west of the Mississippi as part of the US also like Hitler? Did the US declare war on the world when they made Hawaii part of the US? First, Social Nationalism is the type of nationalism that views all elements of SOCIETY as falling within the concept of the nation. It means that the nation is essentially one society, and that all those who partake in the social life of the nation become part of the nation regardless of religion, race, or ethnic origin. So it is not a term with no meaning even if the term was defined by Antoun Saadeh. Second, to suggest that at no time in history was the area of natural Syria politically united is to display an ignorance of historical facts. Natural Syria had been united in its exclusive form under both the Assyrian and Babylonian states, and under the latter part of the Seleucid State, and was also part of a larger political entity under numerous empires. Third, the concept of the nation, as defined by Saadeh, does not rely on a single historical period or political event, but rather on a unity of social and economic life that develops through a long period of interaction and social evolution within a contiguous geographic territory and natural environment. Fourth, with respect to the Jews, Saadeh defined Jews as those who adhere to the Jewish ideology of claiming Syrian land as belonging to the Jews exclusively, which naturally poses a threat to the continuous life of the nation. Don’t forget that the term Jews was commonly used at the time to refer to the invaders of Palestine. Saadeh never called for, nor did he ever attempt, to expel Jews who lived in Syria previously. He referred to the Jewish “settlement” in Syria which he considered a settlement that cannot possibly reconcile with the concept of Syrian nationalism, since its aim is to expel the Syrians from their land and replace them with Jews. Of course a foreign group with such ideological inclinations cannot possibly fall within the definition of the nation, as they are actively working to destroy the nation. Unfortunately, we always tend to rely on emotion rather than reason when approaching any issue. And therefore anything on which we have a preconceived negative view we tend to dismiss and attack even without truly understanding it. Social Nationalism does not aim to impose anything on anyone. Social Nationalists believe that all people of natural Syria form a single nation and have a right to preach their ideas and persuade the people to accept them. If this in itself is a declaration of war on the entire world as you claim, then this world must have a serious problem with freedom of thought and expression when it comes to our people. AIG your logic is very messed up. You can’t ask occupied people to renounce violence against their occupiers. Let’s just assume that we have free elections in Syria. I run for president and get elected by 55%. My platform called for all kind economic reforms. I will open the market; allow private accredited universities to set up shop; encourage capital investment; educate on and allow venture capitalist to invest in the country. I remove all export taxes and encourage all expats to comeback. I invest in education and research and development. My vision is to make Syria a regional power and be able to manufacture and export anything the people wish to. My foreign policy calls for peace with Israel only after Israel apologizes for the massacres and renounces violence. I also call for either a one state solution or the 1948 borders to be implemented. After all that is the UN division lines. I will invite every news outlet and ask the Palestinians (yes all of them) to mass at the Israeli border and demand their return to their land. I will tell them to walk through the check points. I will create a nightmare for Israel to deal with. Are they going to shoot at peaceful protesters in front of all the camers? Are you going to demand your government to negotiate with me? I think we have a vaccum of leadership in the ME,it will take time to know how all these revolutions will end. When do you think Israel will cease to exist? Do you think Israel will out-live the Islamic Republic of Iran? It’s nice to have all these predictions. But yours is still quite vague. No date? I wouldn’t hold your breathe. Arab regimes seem to be falling at a much higher rate. would you give me prediction about the fall of Syrian regime, since you predict it?and let me see how clear and not vague you are. The Syrian Ba’athist regime of President Bashar al-Assad has so far survived the wave of popular unrest currently sweeping the Middle East region. A combination of Assad’s opposition to the United States and Israel, the memory of the crushing of a 1982 Muslim Brotherhood revolt, and fear of a pervasive security apparatus act to stifle popular unrest. Whether Syria can continue to remain immune from calls for change will be dependent on whether democratic transition processes in other parts of the region are seen by the Syrian population to deliver lasting and far-reaching change. Syria, ruled by an autocratic family regime for four decades, has so far avoided the fate that has befallen other Arab dictatorships since the beginning of the year. Whether, Bashar al-Assad, the Syrian president, can continue to deter the protests that have shaken the region depends largely upon whether Egypt, Tunisia and possibly Libya can transfer successfully from dictatorships to functioning pluralistic democracies. If the transition process succeeds, Assad will have little choice but to begin a process of ushering in the political reforms that he has promised but failed to implement since taking office in July 2000. However, if chaos and violence take hold, Assad will almost certainly ease back on reforms and instead maintain his grip on power through repression. In many respects, Syria would appear particularly vulnerable to a popular uprising. It has been ruled by the same family dynasty since 1970 which uses repression and violence to stifle dissent. Corruption is rampant. The population has more than doubled in the past 30 years and unemployment is increasing, as are the prices of subsidised goods. The gap between rich and poor expands each year. Oil production, a traditional mainstay of the Syrian economy, is in decline. Nevertheless, Assad appears relaxed, despite watching his regional counterparts tumble. He has even dispensed advice to other leaders still clinging to power, telling the Wall Street Journal in early February that Syria was immune from rage because he is “very closely linked to the beliefs of the people”. His anti-Israel stance and tense relationship with the US, he said, resonated with the Syrian people and spared him the “US puppet” label often used against former Egyptian president Hosni Mubarak and former Tunisian president Zine El-Abidine Ben Ali. There is an element of truth in Assad’s claim, but the policies of Egypt and Tunisia toward the US and Israel were not the motivating factors that brought hundreds of thousands of demonstrators onto the streets of Cairo and Tunis. Instead, Assad’s greatest asset for retaining control is a pervasive fear in Syria of the state security apparatus. Memories are still fresh of the brutal methods implemented by the regime of Assad’s father, Hafez, to quell a rebellion in the early 1980s by the Muslim Brotherhood. Up to 20,000 people may have died when the uprising was crushed in the Hamah in February 1982. The Muslim Brotherhood is still banned in Syria and its leaders live in exile. Other than the Islamists, the other main domestic challenge to the Ba’ath Party’s rule has come from the Kurds who live mainly in the northeast of the country adjacent to the Iraqi and Turkish borders. The Kurds have protested for greater rights on several occasions. The most recent uprising in 2004—during Bashar al-Assad’s mandate—was heavily suppressed and followed by a campaign of arrests and imprisonments of Kurdish activists. A moderate democratic secular opposition flared briefly in the spring of 2001, months after Assad inherited the presidency from his father in expectation that reforms would follow, but the state cracked down on this so-called “Damascus Spring” and the secular opposition remains fragmented and weak to this day. One potential weakness of the regime is that it is dominated by the minority Alawite sect in a largely Sunni country. The Alawites represent roughly 10 per cent of Syria’s population of 21 million and their minority status could be a mobilising factor within the Sunni majority. On the other hand, Alawites hold the key levers of power in the military and security apparatus and they may be more determined to cling to power, fearing the backlash against the community if a Sunni regime takes over, especially if it is Islamist in nature. Assad’s youth and personality also work in his favour. At 45 years old, he is relatively young and has been in power only 10 years. Many Syrians who resent the pervasive corruption and lack of freedoms more often tend to spare Assad from criticism and instead blame advisers around him. Despite these factors, Syria has not been isolated from the uprisings around the Arab world. Syrian activists used Facebook and Twitter to galvanise support for opposition protests. In early February, a few dozen protestors gathered outside the Egyptian embassy in Damascus closely watched by security officers who, according to Human Rights Watch, took photographs and inspected identification documents. A “day of rage” was scheduled for 5 February, but no one showed up. However, in a more interesting development on 19 February, some 1,500 people gathered for a rare protest against the beating of a motorist by two policemen. Syrian Interior Minister Said Sammour hurriedly arrived at the scene and berated the crowd for holding a “demonstration”. The crowd allegedly said they were protesting police behaviour only and some chanted their support for Assad. However, the unplanned protest appeared to rattle the regime. On the one hand, Assad lifted a ban on Facebook, in place since November 2007 although widely ignored through the use of proxy servers (ignored by Assad himself who has a Facebook page). Assad has also promised new reforms including local elections, ratification of a new media law and the easing of restrictions on non-governmental organisations. On the other hand, on 15 February, Syria sentenced Tal al-Mallohi, a female blogger, to five years imprisonment on charges of spying for the US. Human rights activists say she had written articles critical of the regime. Another blogger, Ahmad Abu al-Khair, was also reported arrested on 20 February by media sources and has not been seen since. It is too early to judge whether those countries that have undergone internal regime change can transition to stable democracies. But if Assad wishes to spare himself the fate of Mubarak, Ben Ali and perhaps also Qadhafi in the near future, he may have little choice but to accelerate and deepen the reform process in the coming months. Even Syria’s downtrodden population may not continue to stand quietly by if they see freedoms flourishing and economies growing in the rest of the region. Speaking of irrationality, it’s your definitions and arguments are circular and flawed. I don’t blame you because Saadah did engage in circular arguments “Every person living in this certain geographic location is ‘naturally’ Syrian. They are ‘naturally’ Syrian because they live in this geographic location.” Kuwait is no more ‘Syrian’ that it is Iranian. So is Cyprus and Sinai and other territories that Saadah attributed as “Natural” Syria. What you said about history is not true. Assyrians conquered the land west of the Euphrates. They went as far as Egypt. It would be absurd to consider Egypt and Sinai as part of natural Syria because it was conquered at one point by the Assyrians. With that same logic, then the Iranians or Egyptians have claim to East/West of the Euphrates because at one point in history they also conquered that land. There is nothing “natural” about political entities. They happen to be that way because of circumstances in history and not because of some formalistic laws that Antun Saadah came about. Michel Aflak derived different laws and claimed all the geographic location from Morocco to Bahrain, Yemen to Syria, are Arab lands. He surely came at different conclusions using the same set of factors. How come they had such wide different conclusions yet analyzed the same input? My point is that political boundaries do not come about some certain formula because this isn’t exact science. On your example of Egypt, an Egyptian demanding the annexation of Sudan today because it was once part of its Kingdom is out of touch with reality. Sure he has the right to think and speak like that, but if I was Egyptian or Sudanese also have the right to warn that the majority do not accept such proposal and if any actions were taken it could lead to war and destruction and there are much better and viable alternatives. You have the same right to preach all about your greater Syrian plan, but I at the same time have right to warn my people that if these bombastic and idealistic views were put to reality, we would be going to war against the whole world and probably end up losing the last bit of land we got. My experience with the SSNP, from books and association with members tells me that they do not tolerate such views, and most of whom I discuss tell me that such views would lead to treason. This is what allows me to conclude that if in power, the SSNP will not tolerate freedom of speech and most probably end up eliminating all rivals political views from power. It wouldn’t be very surprising because ultra-nationalistic parties all tend to have very similar characteristics with disrespect to fundamental civil and political freedoms. First, you are drawing conclusions about the Syrian Social Nationalist Party based on your own speculation as to what might happen if the views of the Social Nationalists were to be realized. You seem to forget that many disputes between nations regarding border demarcations and sovereignty over particular pieces of land exist to this day without that resulting in the outbreak of wars. Germans to this day do not accept that the Alsace-Lorraine as French territory, yet have officially set aside their dispute over this region for the sake of political pragmatism. As for the rest of your attack on the Social Nationalist philosophy, it is a straw man fallacy, as it attacks something that Social Nationalism does not represent and that Saadeh never argued. Saadeh did not argue in circles about the national identity of Syrians, but you have refused to understand his position due to a prejudicial view you hold about the SSNP. You can refer to the Genesis of Nations to fully comprehend Saadeh’s view on how nations are formed, which is a detailed, thorough, scientific explanation based in sociology, history, anthropology, and geography. The horizontal and vertical interaction on and with the land inhabited by man helped shape human development in three basic ways: its topography greatly determined the nature and scope of human adaptation as well as the form of human resources and their combinations; its natural composition influenced the outward and psychological makeup of peoples; and, finally, its natural division into zones facilitated internal group unity and prevented the integration of mankind into a single community. The geographic barriers of the Syrian homeland allowed the various groups that inhabited this territory to interact and intermix with each other, and prevented their interaction and intermixing with peoples outside these boundaries, helping to create a distinct national composite that is of a different character than that of other nations around us. Thus, the basic definition of a nation is a group of people who inhabit a specific geographic territory who, after a long period of interaction on and with the land it inhabits, and through a process of evolution, develops distinct characteristics differentiating it from other groups. And according to this definition the people of natural Syria form a single nation based on this continuous interaction and unity of life that have existed on this land for thousands of years. Further, your argument that there is nothing “natural” about political entities is absolutely correct and does not clash with the views of Saadeh and the SSNP. Saadeh’s view is clear that nations can be divided into multiple political entities or included in a larger political state, which is why Saadeh was very careful to differentiate between political matters and national ones. It is also why Saadeh does not link the definition of the nation to a particular historical period or political event but rather to the actual unity of social life. This means Syrians are not a nation because at one point in time they were united under one political entity, but rather because their continuous interaction on this single geographic territory has led them, through a process of social evolution, to develop a unity of life across this land. You seem to have a problem with the SSNP claiming that Ahwaz is part of the Syrian homeland because, as you contend, Iran would never allow it. Yet does it bother you that the people of Ahwaz themselves do not regard themselves as Iranian and do not wish to be under Iranian rule but are being forced to accept such conditions? Isn’t Iran declaring war on the people of Ahwaz by forcing them to live under its rule? With respect to Sinai, you should know that the people of Sinai are not Egyptian in origin, and even Palestinians will tell you that they are Palestinian. In any event, your speculation as to what would transpire should the SSNP come to power is an inherently flawed analysis, because the SSNP does not aim to take power, in that it does not aim to rule over the people. Rather, it is a renaissance movement that aims to change the very thinking of Syria society, in order to transform this society from the stagnant state in which it currently finds itself, into the dynamic nation that it has historically proven it can be. Finally, your attempt to compare Saadeh with Michel Aflak is, in my opinion, baseless, as Aflak never attempted to define the concept of the nation and never provided any scientific explanation as to how the Arabs constitute a single nation, but rather relied on emotional attachments to religion and partial cultural factors which he felt would resonate with the masses. Such exercises do not indicate an objective attempt at discovering a social fact but rather a political endeavor aimed at extracting political benefits through emotional agitation. The Israeli Government will within the week announce that “Israel is still definitely commited to the peace proces” but at this moment in time “peace is impossible”. It will also reaffirm its sincere commitment to the peace process which it has followed for close to three decades with the Palestinians and other nearby states. I discovered that I am addicted to SC. I visit it several times during the day. This blog was essentially silent during the last two days. We seem as if we ran out of things to say. When there are no new messages, I check it more often. This is affecting my work. In the above post there was information about the IAEA inspections of some locations in Syria, and the degree of Syrian cooperation with the IAEA inspections. Are we going to see the same tricks used in hiding the motives to invade Iraq, practiced on Syria, while the Israeli clandestine Nuclear program is off limits?